WMAP Five-year Paper Figures, J. Dunkley, et al. Left: For maps with Np = 768 pixels and Ni (marked N in figure) synchrotron spectral indices with Gaussian priors of β = -3.0±0.3, the recovered index estimates are biased for simulations with no signal. The bias increases with the number of pixels sharing the same index (i.e., with decreasing Ni). 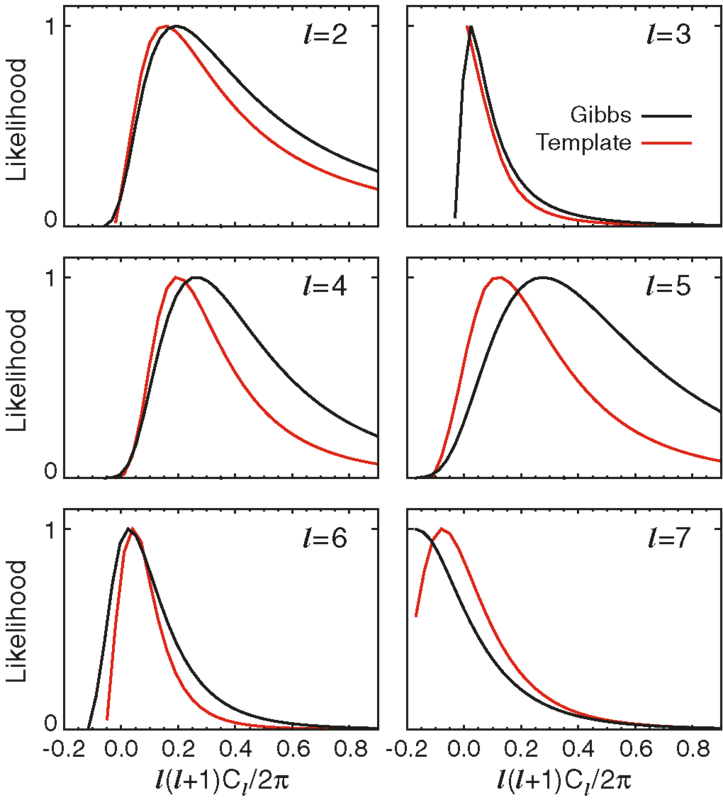 Right: The phase-space prior that is added to produce unbiased estimates for the indices. In the rest of this analysis we use Ni = 48. Comparison of input (left) and output (middle) component maps for a simulation with Nside=8. The polarization amplitude P = √Q2 + U2 is shown for the CMB (top), synchrotron at 23 GHz (middle), and dust at 94 GHz (bottom). 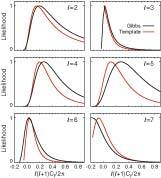 The right panel shows the difference in standard deviations per pixel for the Q Stokes parameter. The dust component has a Gaussian prior on the dust Stokes parameters of [Q,U](n) = 0 ± 0.2Id(n), where Id(n) is the FDS dust intensity (see text), which reduces the deviation per pixel and leads to the structure in the difference map. The distribution of the optical depth to reionization τ for simulations with five-year WMAP noise levels. 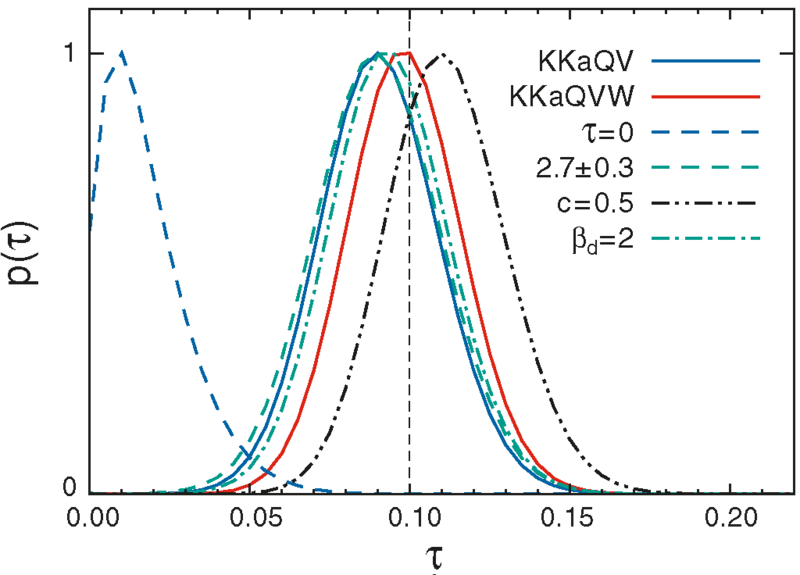 The optical depth is recovered for an individual simulation with τ = 0.1 for KKaQV and KKaQVW, and a τ = 0 simulation is consistent with zero power. 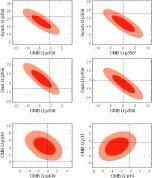 Changing the index priors to βd = 2, or βs = -2.7±0.3 have negligible effects on the recovered CMB power. Incorrectly modeling the synchrotron as a power-law for a simulation with an index that increases by c = 0.5 between 23 and 94 GHz increases τ by ~1σ. Marginalized 68% and 95% confidence levels for a subset of the A and β parameters. 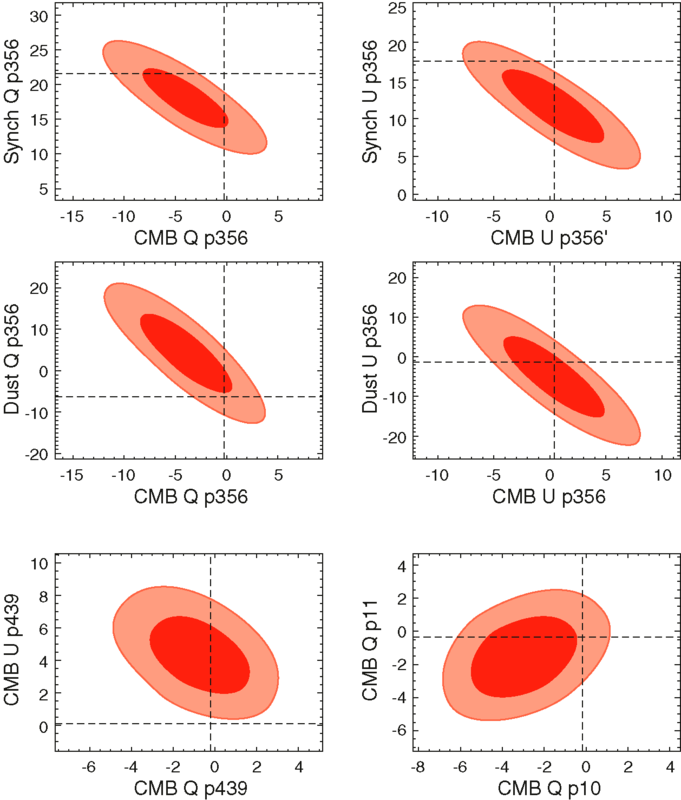 The top and middle panels show the correlation between the CMB, synchrotron and dust Q and U amplitudes (in µK) for an arbitrary single pixel (pixel 356 out of 768 using HEALPix nested ordering). The bottom panels show the correlation between Q and U for a single pixel (p439), and between two adjacent pixels (p10 and p11). By marginalizing, rather than finding the maximum likelihood, the error on the CMB amplitude is inflated to account for foreground uncertainty. Low resolution polarized Q (top) and U (bottom) maps of the CMB, synchrotron, and dust emission, estimated from the five-year K, Ka, Q, and V band maps using Gibbs sampling. Pixels inside the processing mask are grey. The CMB maps (left panels, thermodynamic temperature) do not show significant Galactic contamination in the plane. The synchrotron amplitudes (center, antenna temperature), are defined at K-band (22.8 GHz), and are consistent with the total K-band maps, with high Q and U emission from the North Polar Spur, and high Q emission in the Galactic plane at longitude 110 ≤ l ≤ 170. The dust amplitudes (right, antenna temperature) are defined at W-band (93.5 GHz), and have a Gaussian prior on Q and U of 0 ± 0.2Id where Id is the dust intensity. Estimated 1σ errors on the low resolution maps of the CMB (left), synchrotron (center), and dust (right) Q and U components, as shown in Figure 6. 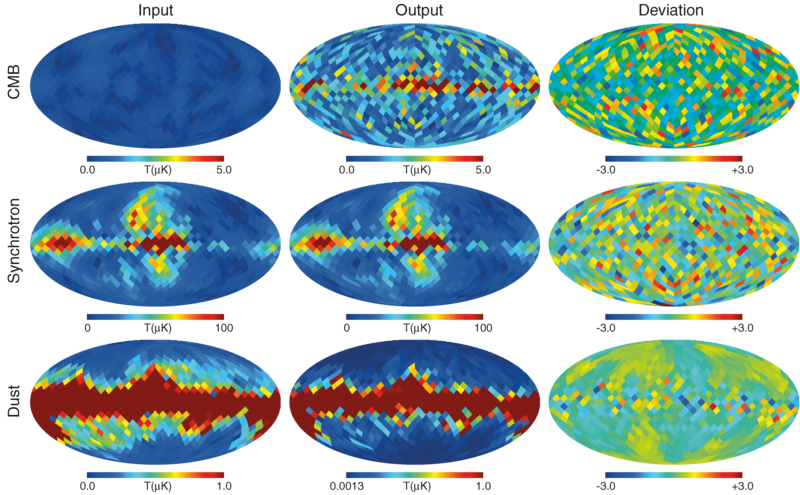 The CMB errors are more fully described by a covariance matrix, including pixel-pixel correlation and Q/U correlation, so the maps can be used for cosmological analysis. The errors on the dust maps (right) are dominated by the prior that limits the dust polarization fraction to 20%. The middle panels clearly show the two sources of uncertainty in our CMB polarization maps: detector noise in the ecliptic plane (which traces a sideways S in the map) and foreground removal uncertainties in the galactic plane. 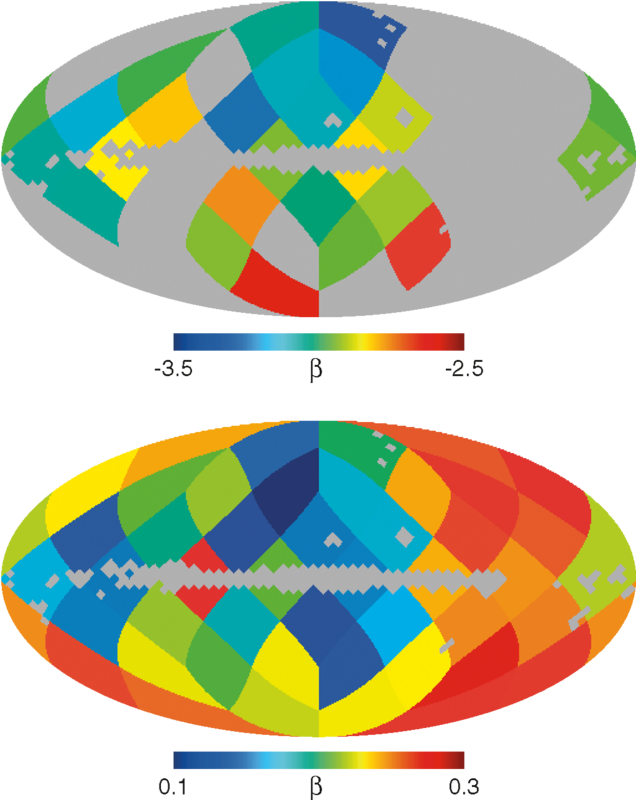 Conditional likelihoods for the CMB EE multipole moments estimated from the polarization maps described in this analysis (black), compared to the template cleaned maps described in Gold et al. (2008) (red). They are computed as in Nolta et al. (2008) by fixing all other Cl values at the fiducial ΛCDM values. There is agreement between the two methods. The estimated synchrotron spectral index (top), and 1σ errors (bottom), estimated in 48 HEALPix Nside=2 pixels. A Gaussian prior of βs = -3.0 ± 0.3 is imposed in each pixel. In regions of low signal-to-noise (near the ecliptic poles), the prior drives the spectral index estimate, so we mask the index for pixels with σ(β) > 0.25. The mean index averaged over the unmasked pixels is -3.02 ± 0.04 for prior -3.0 ± 0.3. 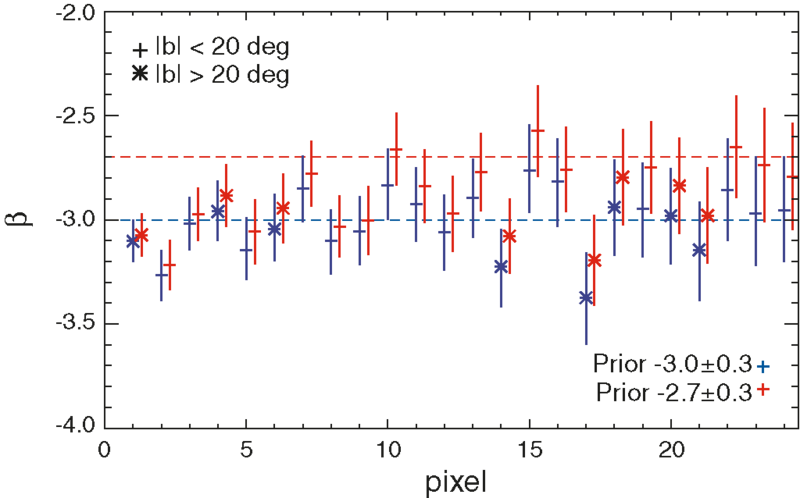 Marginalized mean and 1σ error bars for the synchrotron spectral index parameters with highest signal-to-noise for the five-year WMAP data, for Gaussian priors of -3.0 ± 0.3 and -2.7 ± 0.3. The pixels are ordered with increasing 1σ errors, with the highest signal-to-noise pixels on the left. The prior has only a small effect on the estimated indices.